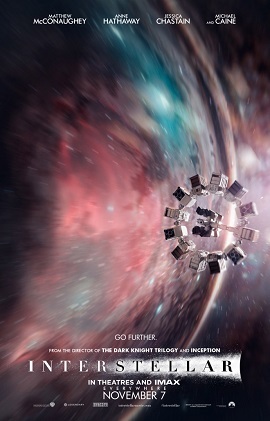 Review: Interstellar – to infinity and beyond! Interstellar is Christopher Nolan’s latest film. It’s a science fiction adventure about a team of NASA astronauts who travel through a wormhole in search of an inhabitable planet, because Earth is dying. Directed by Nolan, written by Nolan and Jonathan Nolan. The good; I love the robots. As I’ve mentioned, it’s robot season. In the film there are two main robots, TARS and CASE, they’re reminiscent of the monoliths from 2001: A Space Odyssey, but they’re move-able with separating joints to make limbs and other shapes, it’s like a big shapes puzzle. The AI that makes these robots have a personality also reminds me of B.O.B. and V.I.N.C.E.N.T. from The Black Hole. I just love that the designs are practical versus form and elegance. The portrayal of the worm hole was stunning. The visuals in this movie are amazing, you have to go see it on the big screen. For an adventure movie there sure are a lot of emotional moments. The actors do a great job with these scenes. The bad; the sound design was a little much in some areas, meaning that the score and the sound effects over powered the dialog. It was hard to hear at times. For a science based movie, they used “love” as a factor. When the scientists have to make a choice of where to go next, one of them uses love to convince the others… that only hurt her argument. It felt out of place, perhaps a little more set up could’ve made that flow better? There’s a “plot twist” in the second act, don’t want to say too much, but it felt a bit forced. Overall, I had a good time, I don’t want to say too much about the plot for fear of spoiling it. After seeing the film it elicits conversations, and that’s good here. The premise reminds me of The Black Hole, the robots remind me of 2001: A Space Odyssey, the music reminds me of Philip Glass, space travel and the video messaging is very much like Alien and Aliens, the special effects remind me of Tree of Life, the second act reminds me of Sunshine, the third act’s reveal reminds me of Gundam … and so on… If you were to do a double feature, I would pair Interstellar with Big Hero 6, strictly for the visuals. This entry was posted in Movies/TV, Reviews and tagged 2001 a space odyssey, christopher nolan, interstellar, interstellar movie, movie review, sci-fi, space on November 12, 2014 by Eugene.